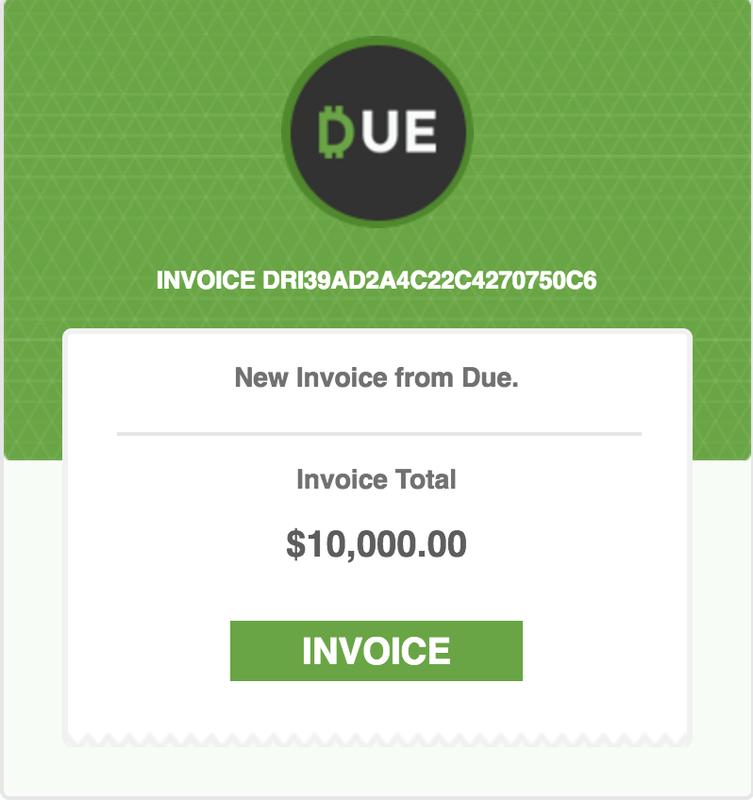 With Due, you can now send recurring invoice templates to your clients. Setting up recurring payments guarantees your business recurring revenue which means steady cash flow and growth. If you’re looking to setup recurring payments directly on your website, say for a subscription service, you can follow this tutorial which will give you access to API documentation and a plethora of e-commerce extensions. If you’re looking for a basic tutorial on Due Invoicing click here. This is the ‘Invoices’ tab. In this section, you can access and manage all of your past invoices. Select the green ‘ + ‘ symbol to create a new invoice. This is a recurring invoice template. 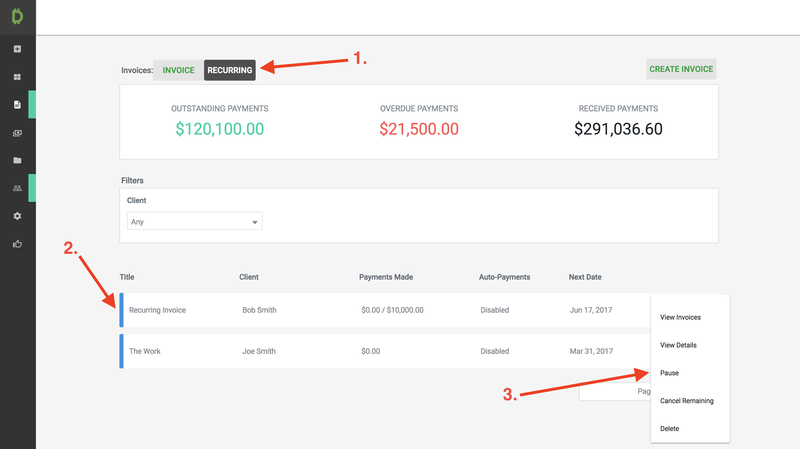 After you’ve created a client, or selected an existing one, you can set the parameters of your recurring invoice here. Please note that you can edit this template at any time. 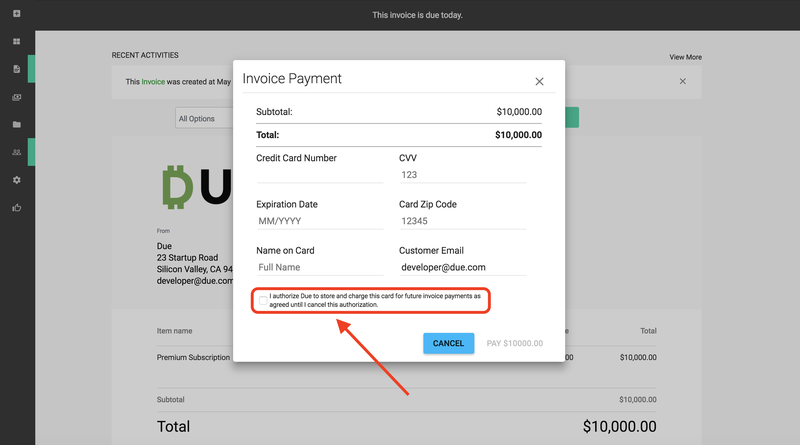 Important: Once the invoice template is created, your client will receive a notification that a recurring invoice template has been created. The email will give them the details of the series. This notification is NOT a payable invoice. Recurring Title represents the summary of work performed. For example, if this is a subscription payment for a monthly service, make that clear in this section. This is required. Start Date represents the date the first invoice in the series will be sent to the client. The Due Date for subsequent invoices will be automatically calculated if you’ve decided to include one. Frequency: Here you will set the frequency of the invoices. In this case, the invoice will repeat every month for the next 12 months. Once the series is created, your client will receive an email that looks like this. Remember, this is not the invoice that needs to be paid. 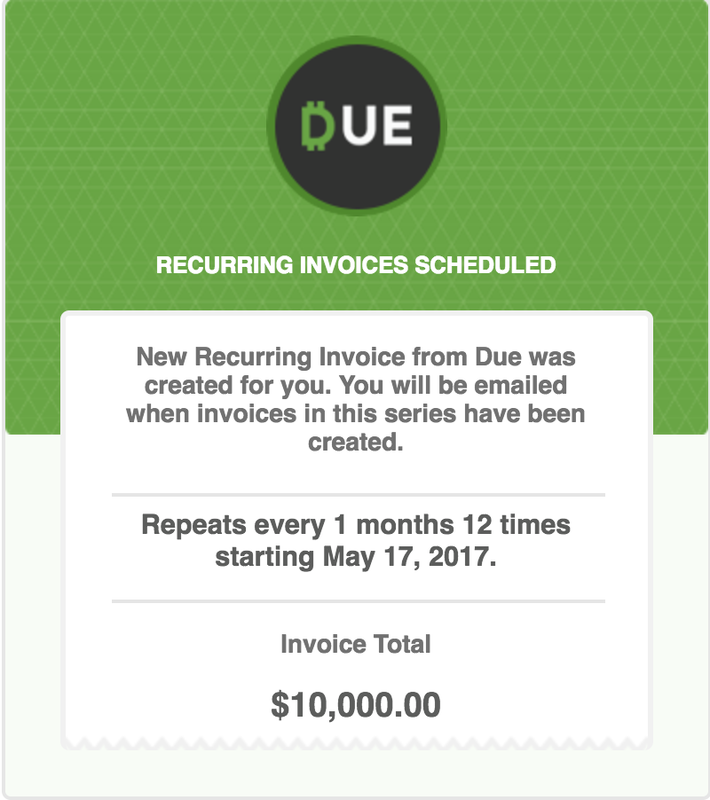 On the ‘Start Date’ of your recurring invoice series, your client will receive an email that looks like this. They can pay the invoice by clicking on the ‘Invoice’ button embedded in the email. These invoices will be automatically created and sent to the clients on the frequency you set in the recurring template. When your client opens the invoice to pay they have to option to authorize auto-payments. If authorized, Due will automatically charge the client’s credit card on the scheduled recurring invoice date. If the client is concerned with security, have them click here to read up on Due’s security procedures. This is where you can access and manage all your recurring invoice templates. This section gives you the basic information on the recurring template. This is your list of options for your recurring template. In order to edit the template, you’ll need to click ‘View Details’ and then click ‘Edit’. 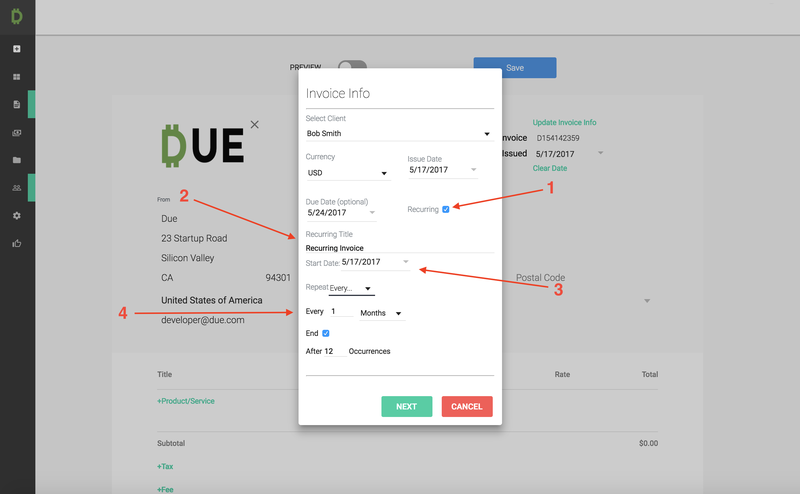 Now that you know how to use recurring invoices feel free to set up a few templates with your clients. If you have any questions or concerns feel free to contact support@due.com we’re here to help! A finance Industry veteran, Charles Brown writes articles related to current financial trends, and creates unique and useful content about business ownership for his company Fastcredit.repair. With a lot of knowledge and experience in this field, he has moved on to sharing his knowledge through writing.